Enjoyable, brightly animated and frequently funny family comedy with great vocal performances, though the story's original message gets a little lost in all the chaos. 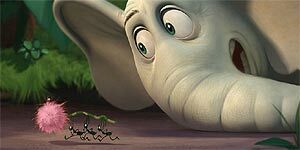 Based on the classic Dr Seuss book and produced by the makers of Ice Age, Horton Hears A Who features Jim Carrey as Horton, a happy-go-lucky elephant with an active imagination who lives in the Jungle of Nool. One day, he hears a noise on a passing speck of dust and soon discovers that the tiny townsfolk of Who-ville, led by the Mayor (Steve Carell), inhabit a minuscule world on the speck that is in great danger unless Horton can find them a safe haven. Of course, when Horton tries to explain this to his jungle friends, everyone thinks he's insane, causing the haughty and officious Kangaroo (Carol Burnett) to try and put a stop to Horton's dangerous imagination by sending Vlad the Vulture (Will Arnett) and a gang of evil monkeys after him. Meanwhile, the Mayor has his hands full trying to convince his fellow Who-villians of the danger they are in. There are several gags and Carrey and Carell give terrific vocal performances, while there's strong support from reliable comic talents such as Seth Rogen (as Horton's pint-sized friend, the hyperactive hamster Norton) and Will Arnett. Similarly, the animation is both brightly coloured and modern-looking, while remaining true to Seuss' original character designs. Though the plot sticks closely to the original story, the oft-repeated message of the book (a person's a person, no matter how small) gets a little lost amongst all the jungle-based chaos, though there is a subtle but effective environmental message to make up for it. Similarly, it's never made clear why Kangaroo views Horton as such a threat and her character is frustratingly under-developed as a result. Dr Suess' Horton Hears A Who is an entertaining family film that kids will enjoy and adults won't object to, though it's a shame that there wasn't room for a bit more of Seuss' poetry.